It's no secret that the JRPG genre isn't exactly flourishing as it once did. Not outside of Japan anyways. Yet while the well dries up and the big franchises flounder, a little company called Atlus has our backs. It's thanks to them that we have games like the Shin Megami Tensei and Etrian Odyssey series. They were the ones who published the likes of Ogre Battle and Growlanser. The were even responsible for bringing Demon's Souls and Disgaea to the north, where they were wildly successful. In recent years Atlus has become the west's biggest and best source of the JRPGs that AAA studios won't make any more. So when I was told that they had made a superb Chrono Trigger inspired JRPG for the DS, I knew I had to play it. In fact, the game was so popular that Atlus had to do a second run of production because it was so in demand once people knew it existed. I've finally managed to find the time to devote to the game, and so I thought I would give my impressions, having beaten it in it's entirety. 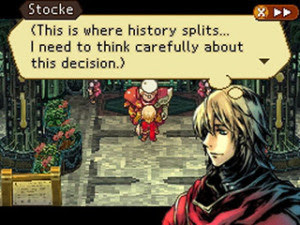 Radiant Historia is a game about timelines, and as such evokes a lot of comparisons to Chrono Trigger. The basic idea is that the game is split into two timelines, and the player has the ability to jump to any key event experienced in either timeline. The idea is that if you play a single timeline, you end up running into roadblocks, and to progress you much either go back in time or spend some time in the other timeline in order to acquire a new ability or change a key event. The idea is that the world is quickly charging towards it's end, and before the game has even begun the world has been doomed several times. It up to the protagonist, Stocke, to manipulate events and lead the world down a different path. Interestingly enough, this leads to a lot of interesting situations where the decision that keeps the world alive isn't necessarily the decision that is best in a given situation. Many choices you can make will lead to a scenario where the world ends, resulting in a "game over" ending. What's interesting about these endings is that none of them are all bad. They all give the impression that your decision had a positive impact, but in the end it did not divert the world's path to destruction. You won the battle, but the war was ultimately won. Then you simply go back in time and pick the other option, and unfortunately this is where the game's cracks begin to show. As intriguing as the time traveling system is, it's both incredibly repetitive and surprisingly linear. The game may seem wide open at first, but you quickly find that the way forward is always to play one path until you hit a dead end, then switch paths until you hit another one, and repeat. Similarly, because you spend so much time jumping between key events, you end up covering the same ground over and over again. There are many points where you cannot avoid the intermediary events between key points, and all the scene skipping in the world doesn't mean you won't be running through Lazvil Hills and the Gran Plains a dozen times over. This goes doubly for the side quests, unfortunately. Side quests tend to be a lot more interesting, and a lot more fulfilling, but also a lot more frustrating. Many quests will require you to progress much further into the timeline before you can complete them, and some even require you to skip between timelines. When you stumble across an object and think "oh hey, that guy back in that place at that time needed this thing", it's very satisfying to make that connection. But for every time that happens, there's two where you completely forget who wanted the object, where they are located and what exact time window you need to be in to talk to them. What's more, after jumping back and forth in time so much it becomes very easy to forget what happened in what timeline, what you need to actually do to progress from event A to event B etc. Actually completing all of the sidequests without a walkthrough is an extremely monumental task, but it really didn't have to be if the game just had a proper quest log and a better indication of how to progress along a timeline you've long since forgotten about. But enough about timelines and all that jazz. 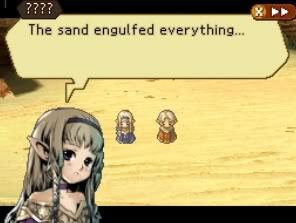 One of the most interesting parts of Radiant Historia is that it has one of the most interesting takes on turn based combat I have personally witnessed. It goes a bit like this: Your team of three faces off against opponents who are arranged on a 3x3 grid. Some enemies take up 2 or 4 or 6 or even all 9 enemies, but most only take a single spot. Among your arsenal of abilities are skills which can knock enemies about, allowing you to position them in opportune locations for killing expedience. 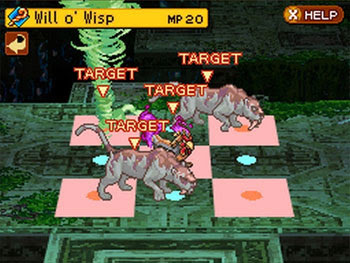 Knock an enemy on top of another one, and subsequent attacks will hit both enemies. Further, you can also do things like knock them into the air, onto traps, out of buff tiles on the ground, etc. Adding to this is the fact that every party member has the ability to switch places in the turn order with any combatant. This can be used to switch the order your guys attack in, or you can swap with enemies in order to try and bunch all your allies' turns together for big combos. It's a novel system that in many cases feels as much like a puzzle as anything else. What's the best way to group up the most enemies as you can? Or is it faster to burn one down at a time? Which character has the best abilities for this situation? Will you need buffs more than movement abilities? etc. However, as with the timeline mechanic, this battle system is definitely not all roses either. First and foremost is the fact that the game seems to have rather poor battle pacing. Each area contains a TON of enemies, and especially considering how much time you spend walking back and forth through the same old areas, the fights can get old fast. While you have the ability to avoid most enemies on the area map, towards the end of the game you start to need experience quite dearly. Couple that with quite low availability for some of the party members, and it becomes a question of, "grind now or grind later?". Now if you had told me this in the first 15 hours of the game, I wouldn't have minded. The battle system is pretty fun. But eventually around the half way mark through the game, battles just get very grueling. The average number of enemies you fight goes up to about 5, and weird things start happening with the turn order. All of a sudden it becomes apparent that how fast your characters are doesn't matter as much as how close their speed is to eachother (so they can build proper combos). When enemies ambush you, you start seeing battles where you can't even attack until you've hopefully survived all 5 enemies attacking 2-3 times. The result is battles just get less desirable, you want to avoid them more, but bosses actually start getting pretty hard. Thus the aforementioned grinding conundrum. As far as the plot is concerned, the game presents a pretty compelling story. As I mentioned earlier, the idea is that you have to try and nudge the world's destiny on a path that doesn't lead to destruction. Unsurprisingly this involves all the tropes of an evil empire, beast tribes that hate humans, people misusing mana etc etc etc. Unfortunately there isn't a whole lot I can actually say without spoiling it. What I will say though is that as the game went on, I was very interested to see where each plot line would lead, and how they would inevitably join back up again. Around the 1/3 way mark things start to get really interesting and it really motivated me to push on through the lul that comes soon after. However the plot, too, is not without issue. Once again we come back to the repetition the time mechanic brings. Because you have two separate timelines that advance in parallel, things often seem like they are going at a snails pace. Until you near the end of the game, it's often really hard to see how things are relevant in the big picture, especially when you start mixing up the history of each line in your head. In the end of the day the payoff is pretty good though. I found the ending to be very touching, in a way that very few games ever are. I guess ultimately what I'm trying to say here is that I'm very conflicted on my final opinion of Radiant Historia. It's chock full of really interesting ideas. At times those ideas are very well executed. At other times the game drags like nobody's business. There was a stretch of about 8 hours within the game where I went from loving it, to hating it to loving it again. In the end of the day I would probably conclude that Radiant Historia would be amazing if it was about 25-30 hours long rather than 40. 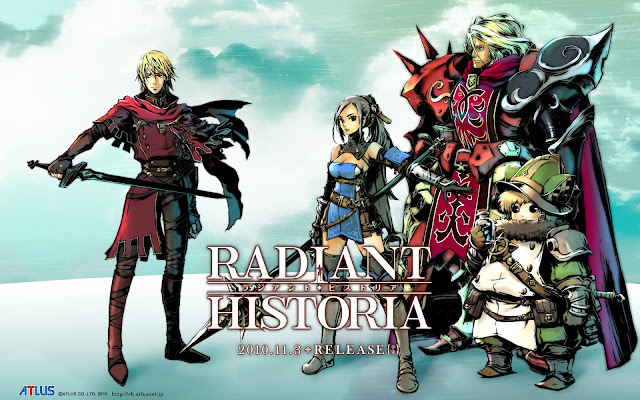 I think the truth behind Radiant Historia though is that, judging by the lack of advertising and the limited initial run, Atlus probably just had some crazy ideas they wanted to play with. I doubt it was ever intended to be more than a fun little experiment, and I suppose in that regard it succeeded. Whatever the case may be, I would still recommend that any avid JRPG fan give it a go. If you are willing to overlook some of the issues I outlined above, then it could easily classify as one of the best JRPGs released in the last 5 years. Even if you can't see past the flaws, it's a one-of-a-kind experience. It truly has the makings of something great. Whether you think it achieved that or not may well vary from my own opinion.